Apparently I didn't give enough clues or a wide enough picture last time. Ace watched these two Kopapelis play a tune of relief at a place named for where one might cross the river. It is named neither in their tongue nor in ours. 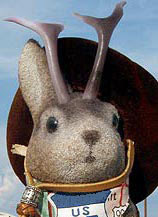 Where is Ace Jackalope? This photo is driving me crazy! How long must we wait until an answer is forthcoming? I've worn out the search engines on my computer. El Vado Motel! I had all the rest, and I even thought of "ford", but when I put it in BabelFish for translation previously, for some reason it didn't come out "vado" until just now. Very cool! I have been traveling and will be in ABQ later in the week, but never thought of the El Vado Motel. Thank you for posting the "Where is ..." quizzes. Like Laurel, I really enjoy them! It's so nice to hear from two roadies! And Lisa T., where are you headed? Perhaps I can post a WiAJ from your projected pathway. I will be in ABQ, Santa Fe, Santa Rosa, and Tucumcari, NM plus Adrian, Texan for ugly crust pie at the Mid-point Cafe!